Srimushnam temple is an very ancient one with stunning architecture all around. The amazingly majestic Gopuram / Vimana welcomes you to the magnificently built temple. Inside the temple, resides the beautiful Bhuvaraha Swami, a small deity much in contrast to the largeness of the temple, but more wonderful. The Deity is one of the 8 Swayambhu Deities in Vaishnava Divyadesams. Ambujavalli Thayar is the Lord’s consort, and the very moment you see Thayar, you feel She is the very embodiment of affection. Hiranyaksha, the brother of Hiranyakashipu, wanted to be a dominant force. To achieve this, he rolled over the earth and took it into the nether world, from where he ruled. Bhoo Devi undertook penance seeking help from Lord Narayana to protect her from the Asura. Lord Vishnu took the form of Varaha (a boar), went into the sea and killed the asura. He brought back the earth on his Adisesha and appeared here as a Swayambu idol. Legend has it that he created the Pushkarani with the sweat emanating from his body after his battle with Hiranyaksha. On his death bed, Hiranyaksha prayed to the Lord and as his final wish wanted the Lord to turn to turn in his direction. Hence Bhoo Varahan’s face is seen turned in the direction of the asura towards the South. An interesting feature of the moolavar deity at this temple is that the face, in the form of a boar, is turned towards South, while the body bearing a human shape is facing West in the direction of the devotees. Childless couples can do a Pooja here and will be blessed with Children soon. Lord Sri Rama Temple : Outside the temple there is another beautiful temple for Lord Sri Rama. The uniqueness in the temple is that Lord Sri Rama is in sitting posture in this temple, a very rare sight. Srimushnam is about 70 kms from Cuddalore & 39 kms from Chidambaram. Please use the interactive map below to get more infor about the location & directions. For all who want to be blessed with a child, visit the Divya Desam 109. 2. Enter inside “Solutions” menu. 3. Yes, it is 109 but not 108 in the above line. 4. It is the site for the “Sri Panchamuga Lakshmi Narasimhar Sannidhi”. 5. You will be blessed with a child. Please provide bhu varaha stotram. Links for Sri Varaha Kavacham and it’s meaning is in the blog itself. Adiyean is not sure if Sri Varaha Kavacham & Sri Varaha Stotram are same. Can u guide me in reaching srimushnam temple from Cochin.the best route & accommodation facility’s.my telephone no is 09567992840. 3 Routes are suggested by Google. 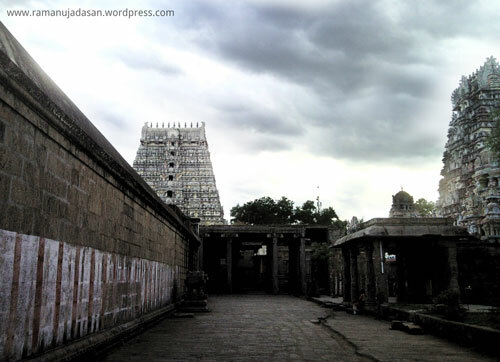 I would suggest travelling via Trichy, so you can visit Srirangam enroute too. please provide me bhoo varaghava ashtotharam.searched in net.Not able to find it. Recently I visited this temple. Wonderful experience Being Markazhi month, we visited the temple in the early morning by 5 am, had the experience of Thirumanjanam of Moolavar and Thayar. Then the regular darshan by about 7.30am after the theertham, sadari and prasadams. The temple is huge with excellent sculptures on the stones and beautiful pillars. A place to be visited by every one.